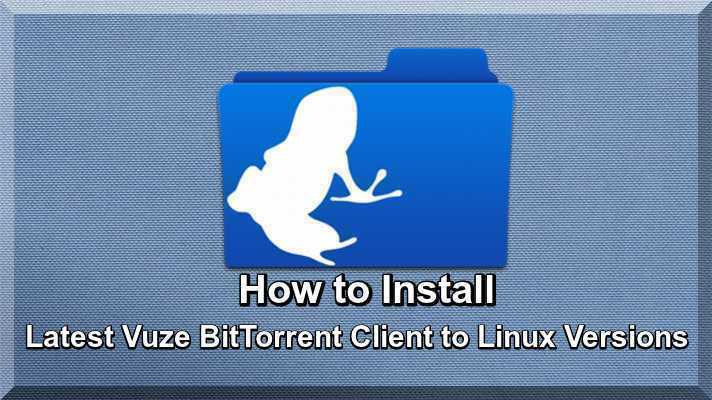 By this useful Article I guide you that how to install Latest Vuze 5.7.3 BitTorrent Client on latest and old Linux versions such as Ubuntu 16.04, Linux Mint 18 (Sarah) and other latest versions. It is well known as Azureus, is an end-to-end software application for all needed torrent. As you may know that Vuze (ex Azureus) is a free, BitTorrent client written and Java and based on the Azureus Engine. It has support for multiple downloads, queuing, prioritizing files, start, stop seeding options. In my experience it is complete BitTorrent downloader, the Vuze does not slow down your computer and it maintains a lightweight footprint and quickly downloads torrents files and movies. The Vuze torrent downloader for Linux basis it is easy for you to find torrents online, whether you are downloading torrents from a tracker site or another. Once you find a torrent the Vuze BitTorrent Client makes it simple to download torrents and automatically, no problems during the electronic failure or your computer restart vuze would start as a resume downloading. This tutorial is very profitable like other tutorials, now I guide you that how to install latest vuze version 5.7 to Linux distros. Now use the following commands and install Vuze on latest Linux Version Ubuntu 16.04 and Linux Mint 18 (Sarah) and other Linux Systems. Once again if you want to install Vuze on Ubuntu 14.04, and other Latest Linxu versions use the following commands in terminal. In any case if you want to remove vuze from your system to use the following command in terminal. In view of the above if you are movie lover it is best torrents downloader fast and easy to use it easily, and also read more Linux tutorials.